The Thai version of Bribespot, an Internet portal and smartphone application where users can report incidents of bribe and corruption, has gone live in Thailand and seems to be heavily used. Bribespot is a kind of self-defense of the public against intimidation by police and other officials, an anonymous service for reporting and tracking bribes online. It was founded in 2011 in Estonia as a non-profit organisation without any external funding and has since been expanding to a couple of countries such as Russia, India, China, Mexico, Australia and some African countries. Users can post bribe incidents and how much money has been extorted from them, and the cases get subsequently visualised on a global bribe map through GPS tracking. There is also an option for providing additional details of the encounter. The user does not have to provide any personal data whatsoever. Later on, there will also be a video upload option. “If Bribespot Thailand succeeds in empowering the Thai public to respond proactively to bribery and thus in helping to bring about such a change, we will have made an important difference,” the group says. 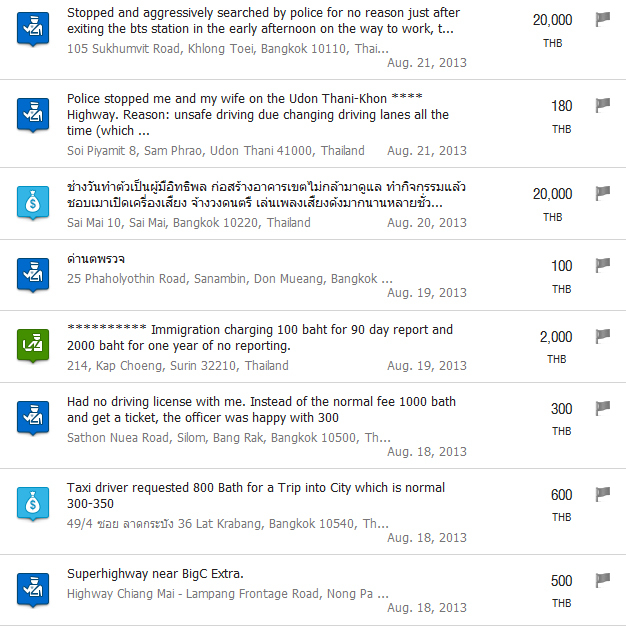 Most of the early entries to Bribespot Thailand are alleged graft or shakedowns by officials, policemen and taxi drivers. It is up to the user to lodge a complaint in addition to posting the information on Bribespot on the website of the Office of the Public Sector Anti-Corruption Commission.